Kerala Blasters host Chennaiyin FC in the first leg of first ever Semi-finals of the Indian Super League at the Jawaharlal Nehru stadium in Kochi. Kerala Blasters will hope to make the most of their outstanding home support. The return leg of the semifinal will be held in Chennai on December 16. Chennaiyin FC finished the group stage at the top of the table with 23 points, while Kerala Blasters finished fourth with 19 points. Chennaiyin FC defeated Kerala Blasters on both occasions in the league, 2-1 at home and 0-1 away and will hope to repeat this in the Semifinals. Kerala Blasters’ only defeat at home in seven matches came against Chennaiyin FC. Kerala Blasters qualified for the knockouts in dramatic fashion after Iain Hume’s goal helped them beat FC Pune City in their last league stage game. Goal scoring has been the major issue for Kerala. They’ve scored the lowest goals in the tournament with nine goals. Kerala will be hoping to maximise their home advantage as their supporters are expected to pack the Jawaharlal Nehru Stadium once again tomorrow just like they have been doing in their seven earlier home games. Sandip Nandy will start for Kerala Blasters ahead of their player manager David James in the goalkeeping role. Gurwinder Singh, Cedric Hengbart, Sandesh Jhingan and James McAllister will form the defence of the Kerala Blasters. Mehtab Hossain and Stephen Pearson will once again form the partnership in midfield. Iain Hume has been in excellent form and has been the go to man for Kerala Blasters all through the tournament. Hume has scored five of the Blasters’ nine goals in the tournament and it’s the key that he remains in top form against Chennaiyin FC. Chennaiyin FC have been the most consistent side in the ISL and they will start today’s match with a psychological advantage even in front of the vociferous home supporters as they had won both the matches against Kerala. Chennaiyin lost some of the momentum towards the end of the league stage as they lost twice in their last four matches and managed just one win. 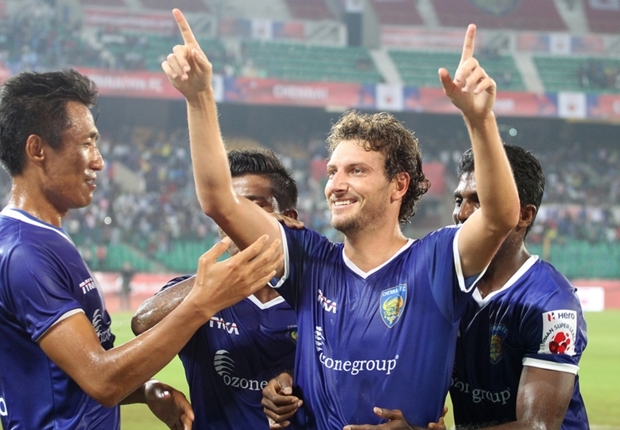 Chennaiyin FC lost the league’s top-scorer Elano Blumer of Brazil and the team’s second-leading scorer Stiven Mendoza to injuries half way through the tournament, but another Brazilian Bruno Pelissari stepped in to fill the void and scored some spectacular goals to to propel his team into the knockout phase. The league’s top scorer Elano will be eager to return to the field after sitting out for over a month with a calf injury. Elano has scored eight times this season and will be looking to add to his tally. Nesta’s introduction will give Chennaiyin the added protection in defence. Bernard Mendy, Silvestre and Eric Djemba-Djemba will start in the defence. In midfield the Indian duo of Denson Devdas and Harmanjot Khabra have been steady. Khabra has truly been a revelation with his running proving to be crucial to Chennaiyin’s cause. Chennaiyin FC still have arguably the best Indian strike-partnership in Balwant and Jeje and Elano’s return will help Chennaiyin FC in the attacking half. Chennaiyin FC scored the most number of goals in the league so far (24), while Kerala Blasters scored the least number of goals (9). Chennaiyin FC are Unbeaten against Kerala Blasters in their 2 games.